It would be the understatement of the week to say the third-generation Audi A8 (D4) is getting a little long in the tooth considering it has been on sale since late 2009, but thankfully an all-new model is less than four months away. Speaking at the Annual Press Conference 2017, Audi’s chairman Rupert Stadler revealed the flagship model is going to be introduced on July 11 at the first Audi Summit in Barcelona, Spain. Underpinned by the MLB Evo platform, the 2018 A8 is expected to shave off a considerable amount of weight even though it will likely be a tad bigger. The VW Group’s biturbo W12 6.0-liter will be offered, but it’s too soon to say whether it will have the same output as it does in the Bentley Bentayga: 600 horsepower (447 kilowatts) and 664 pound-feet (900 Newton-meters). 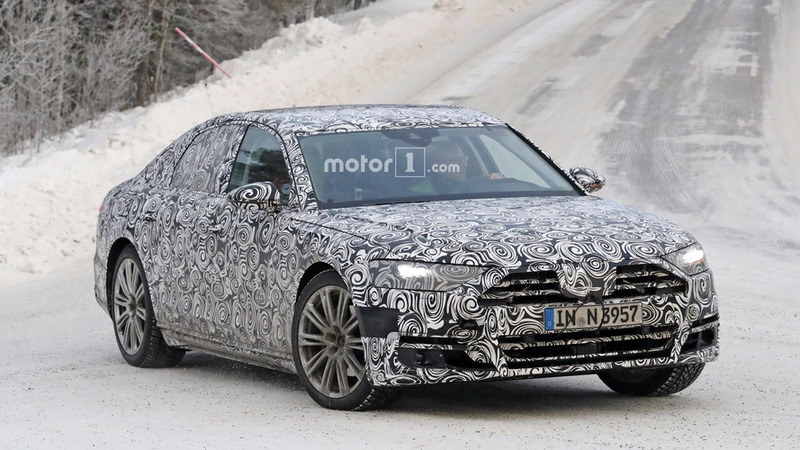 The performance-oriented S8 has already been spotted testing and is likely set to get a biturbo 4.0-liter V8 shared with the Porsche Panamera Turbo where it pumps out 550 hp (404 kW) and 567 lb-ft (770 Nm). With the VW Group’s green push, it wouldn’t be too far-fetched to assume a plug-in hybrid version is being prepared and it might be available from day one. It will be interesting to see whether the SQ7’s 4.0-liter V8 TDI engine featuring an electric powered compressor will find its way underneath the A8’s hood. If it will, expect output to be similar or identical to the 429 hp (320 kW) and 664 lb-ft (900 Nm) available in the hot diesel-powered SUV. 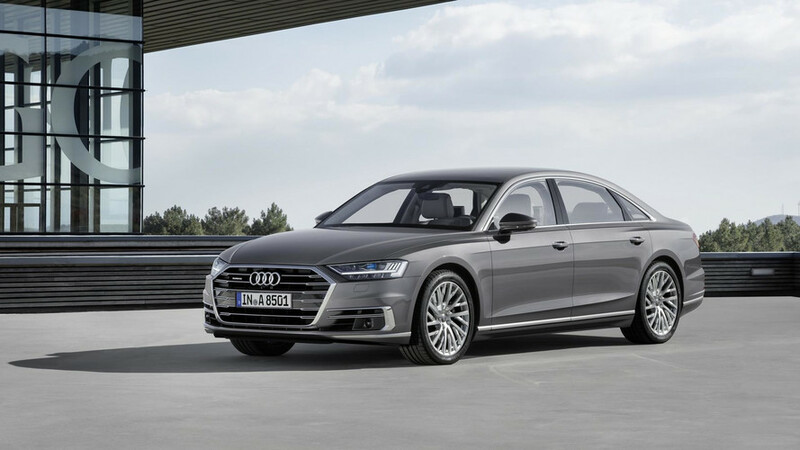 Following its world debut in July, the new Audi A8 will travel to the Frankfurt Motor Show in September and should go on sale before the year’s end. Special thanks go to Motor1 reader “Dusksky” for the tip! I will now give you an outlook on our new models, technologies and other strategic plans. Our Audi brand is rejuvenating its product range. By mid-2018, we will renew five core model series. Here are just three examples: On July 11, at our first Audi Summit in Barcelona, we will have the world premiere of our high-end sedan, the Audi A8**, with a completely new operating concept – generously dimensioned and intuitive. As soon as legislation is passed in our core markets allowing highly automated driving on the highway, and when that is legally safe, we will offer the new key technology in the A8**. At this point, I would like to emphasize the German government’s commitment to piloted driving. With its latest resolution, the cabinet has prepared the way for modern road traffic laws. This will make Germany into a pioneer for automated driving. In the first application stage, the car takes over the task of driving. The driver can then do other things as long as he or she remains alert. In slowly moving traffic on the highway at speeds up to 60 km/h, it will be possible to take one’s hands from the steering wheel and switch over to the data highway, where our information and entertainment services will be available. Artificial intelligence has made this development possible. You will hear more about that at the Audi Summit, where we will present Vorsprung durch Technik at its best. Now let’s look at the second model series that we will renew. The new Audi A7** will continue to be the most progressive large five-door top-segment coupe. It will have its world premiere in the fourth quarter. And like the first generation, the design of the new Audi A7** makes a striking statement for our brand. And in 2018, we will launch the second generation of the Audi Q3**. It will be produced at our plant in Győr, Hungary. But we are not only fundamentally renewing five core model series. We will also supplement our product portfolio with some completely new models. As you know, the Audi Q2 was our newcomer of the year 2016 and met with a tremendous response as our first crossover between sport utility vehicle and coupe. We will now supplement our successful Q family with two new crossover concepts with very sporty styling. The first new model will be launched in 2018: The Audi Q8** will combine the elegance of a coupe with the functionality of an SUV. In Detroit, we presented a plug-in hybrid show car that shows its muscles even at first glance. You will recognize the Q8** from its low roof line and its extremely sporty stance. In 2019, we will then launch the Audi Q4**, entering the segment of compact utility vehicles, or CUVs. We offered a preview of this type of vehicle with the Audi TT offroad concept study three years ago. The very sporty Audi Q4** with a typical coupe silhouette will be positioned between the Q3 and the Q5. In addition to the two new Q-models, we will electrify our customers with the launch of numerous environmentally friendly e-tron models. Between 2020 and 2023, we anticipate strong demand for purely electric automobiles. Starting then, we will have significantly more sales stimulus from electric cars in markets all over the world. Audi quattro in the nineteen-eighties, which already revolutionized the drive concept. The battery-electric Audi e-tron is an SUV: In our core competition, it is the first electric car with everyday usability. With a range of more than 500 kilometers, a unique driving experience and fantastic design, we will make the electric car into a “must have” in the coming decade. The Audi e-tron Sportback** will follow in 2019. We have designed it as a fastback model with an elevated sitting position. Not an SUV, but higher than a standard sedan. And in the following year, 2020, we will offer a premium electric car also in the compact segment. This will be based on the VW Group’s modular electrification platform (MEB). Starting in 2021, we will successively electrify one Audi model in each core series. All electric cars from Audi will be clearly recognizable as such with a progressive design. We will differentiate our product offering according to customers’ preferences and market requirements. In the next five years in China, we will localize four more plug-in hybrids, following the Audi A6 L e-tron**. We take the target of zero emissions seriously. Our mobility of the future will be emission-free in the long term. That’s why we venture the following prediction: By the middle of the next decade, every third Audi delivered to a customer will be either partially or fully electric. That means we will make the models we offer so attractive that at least one in three customers will make the change. How are we preparing for this transformation internally? Focus is important. In the long run, we will reduce up to 40 percent of the current drive versions. We take complexity off the system and will hereby free up resources for the electric drive systems of the future. At the same time, we are creating a convincing system offering. This means that as well as a charging solution for at home, the possibility to charge batteries is required when on long journeys. We are therefore taking on an infrastructure task – something unusual for a manufacturer – to provide starting assistance for electric mobility. So from the e-tron models and the related system offering, I will now turn to production. Our Audi plants are the cornerstones of our brand in the transformation process towards electric mobility. Brussels is the production site of our first electric car. Such a car requires a sustainable value chain. We therefore plan to make the energy supply for the Audi e-tron** plant CO2-neutral in the coming years. We will also set up our first battery production in this pioneering plant of our electrification. The Audi plant in Neckarsulm is the competence center for the development of fuel-cell technology for the Volkswagen Group. Hydrogen as the energy source is the next major milestone on our electrification roadmap. For customers who require cars with a very long range, the fuel cell will be a genuine alternative: lighter, quick to refuel and highly economical in the future. The Ingolstadt plant, as the biggest production facility in the Audi Group, has experience with integrating plug-in hybrids very efficiently into the existing production infrastructure. industrialization of electric-motor production. The logistics center close by is supplied with CO2-neutral energy, thanks to Hungary’s biggest photovoltaic installation for industrial use. And following its successful start, our youngest car plant – in North America – is now preparing for production of the plug-in hybrid version. The Audi Q5 e-tron** will soon drive off the same assembly lines in Mexico as its gasoline and diesel siblings. Sustainability doesn’t stop at the factory gates. Our supply partners are firmly integrated into this strategy. We are therefore introducing sustainability checks and examining our suppliers’ facilities before we place orders with them. A company can only become an Audi supplier if it meets twelve sustainability criteria, which include environmental protection, human rights and working conditions. g-tron* and soon also the new Audi A4 Avant g-tron* and Audi A5 g-tron** models. We will give our customers the additional cost of this clean fuel from the date of purchase of a g-tron for a period of three years. Because we want this innovation for climate-friendly driving to succeed. My message for politicians is: Manufacturers that offer e-fuels should be able to take this into account in the calculation of their CO2 fleet average. So far, only the CO2 emissions from the car have been taken into consideration when calculating emissions. When running on Audi e-gas, the g-tron emits only the CO2 that we have used when producing the fuel. This materials cycle alone would actually be CO2-neutral. But when we take the complete energy-generation process into account, the result is 80 percent less fossil carbon dioxide. So Audi e-gas is a pioneering fuel. With e-tron and g-tron, we are making our customers an offer to switch over. We know that any change takes time. So in this transformation phase, we will continue to need the conventional combustion engine in our portfolio also into the next decade. We continue to develop our successful TFSI and TDI engines; because revolution and evolution in drive-system development go hand in hand. For this reason, we will have at least one model in each series with a combustion engine also as a mild hybrid until 2025. Thanks to our 48-volt electric system, it will recuperate braking energy better than ever before. That will reduce fuel consumption by up to one liter per 100 kilometers. And in the transitional phase, we have the plug-in hybrids I previously mentioned to serve as a bridge technology: emission-free driving for day-to-day situations – and a range suitable for long journeys. Society’s value system has changed. This is resulting in a sustainable and digital lifestyle. Our customers want to take their modern lives with them in their cars. That’s why we will make Audi connect into standard equipment in the foreseeable future. Each Audi will be part of the Internets of things in the future. Its sensors will deliver valuable data for the new swarm intelligence. The next step will be to gather together our customers and fans online and to create added value for them: By 2025, we expect to have ten million users on our digital platform. Together with new partners, we will offer entertainment, shopping, convenience and lots more on this platform. As representatives of the international business press, you will also be interested in our work behind the scenes. We are developing our worldwide production network into a large, cross-border smart factory. I would just like to say: Welcome to the Fourth Industrial Revolution! We are using the power of electronics and big data and analyzing complex production interdependencies in real time. We are digitally connecting all of the separate industrial processes and thinking beyond today’s assembly lines. One day, we will have modular assembly by which people will set the pace again, and the car bodies will only drive themselves to those stations where they are needed. I am talking about intensive human-robot cooperation. At Audi, the firm focus is on the human. And I am talking about self-learning machines. Artificial intelligence marks the birth of a new, exciting way of working in factories. in addition to sustainability and digitization, we are following a third important megatrend: urbanization. For ten years now, more people worldwide have lived in cities than in the country. By 2050, the ratio is expected to be 70 to 30. Cities are getting bigger and bigger. Their essential backbone is mobility. Space is becoming scarce, traffic jams are getting worse – intelligent solutions are required. In this decade, we will create innovative mobility services for people living in cities in more than 15 markets. Pilot projects of recent years under the leadership of Audi Business Innovation such as Audi on demand, Audi shared fleet, Audi at home or Audi select are scalable projects. And we are developing technologies for the city of the future: piloted parking and driving, detailed digital maps from our investment in HERE, which is producing the world’s biggest real-time reality index, connected stoplights, parking spaces and parking garages, and the swarm intelligence of objects in the Internet of things. We are the first car brand to advise metropolitan regions on several continents on the way towards the smart city. By 2020, we will implement three lighthouse projects for urban mobility in Asia, North America and Europe. We see potential for highly automated driving also in the city, where traffic is highly complex; this is the ultimate test for us. In the next decade, we will also have robot taxis. They will close the gap in urban public transport. We will first experience cars without a steering wheel and pedals on predefined short journeys. Self-driving systems are the basis. In this context, we have just founded a separate company called Autonomous Intelligent Driving GmbH, which works for the entire Volkswagen Group. We have set up this company as an open platform. Like with our investment in the digital map company, HERE, partners in the automotive and IT industries are welcome! 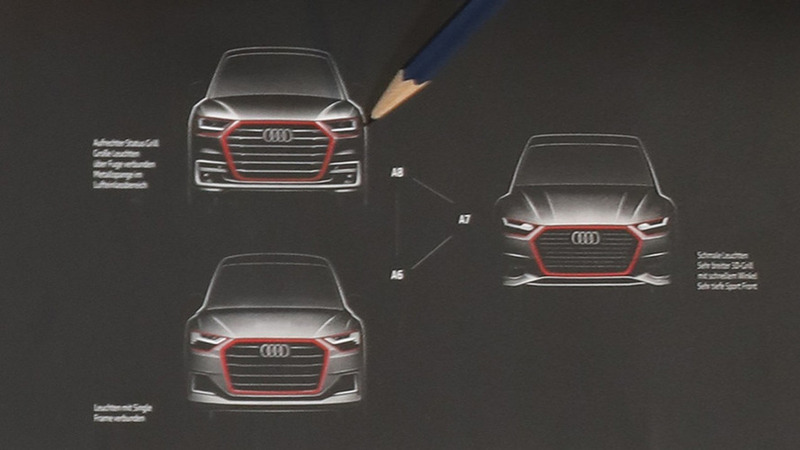 in the past few minutes, I have sketched out how Audi is on its way into the year 2025. I will now summarize. First: We are rejuvenating and broadening our product range, with five core model series renewed by mid-2018 and two new Q models. Second: We are digitizing our products and our production, with potential for connectivity in every Audi, added value on our digital platform and the smart factory as a vision of connected manufacturing. Third: We are creating sustainable offers for the mobility of the future, with the Audi e-tron with convincing charging concepts and more electric cars being planned, a strong g-tron family with innovative fuels, mild hybrids in each core model series by 2025 and new rules for sustainable supply relations. And fourth: We are applying our expertise and our technologies as an answer to the megatrend of urbanization, with attractive offers for mobility in the city of the future and the technology of piloted driving including the founding of Autonomous Intelligent Driving GmbH. So you see, we know where we want to get to and we are positioning ourselves with a maximum focus on the future. We are cautiously optimistic for this year. The diesel crisis has not yet been overcome and calls for our attention. But new products and technologies are on their way. The automotive industry is in its biggest transformation of recent decades. Disruption is accompanying this transformation. For us, the diesel crisis was probably the worst disruption of all time. And nonetheless, I am convinced that it’s giving us the strength to leave behind things we had grown to like and accept. We are doing this so that something new can arise. So we will reinvent ourselves by thinking from the customer’s perspective, by having the right products, by daring to make a far-reaching transformation, and by standing united as a strong team behind this brand.